Trev wrote: I'd also like to see some shots of the 2 kiosk units. Looks a bit used, but that's because I actually used it a lot for testing. I have pictures of virtually every piece of M2 hardware and of most games, so let me know if you're looking for anything particular. I believe this was to show what "Disruptor" was going to be. Even though the setting is completely different (but it's just a concept anyway), the weapon looks *exactly* the same as in Disruptor, which was in development for M2 at that time. That can't be a coincidence. Actually, IRON & BLOOD had made some progress in it's production. One of the biggest issues the PS version had was the game was originally concieved for an analog stick controller, and the PS at the time didn't have one except for flight sticks. NEXT GENERATION did a writeup on it, calling it IRONBLOOD, which included backgroundless (or minimally detailed backgrouds) characters (not just those 2 you see all over the web), and a few concept art pieces. Between that and the sweet looking CLAYFIGHTER III (same issue), it looked like M2 might have a few rocking fighters to bloster games like the POWER CRYSTAL rpg. (if I could get my site active again, I would posted writeup on CFIII and IB already.) Sadly it fell through getting any more info from Take2. Also, for those of you who collect demo cds for games, check out the demo for IRON & BLOOD. It contains audio and some design elements left out of the final game. Well, why not one more bit of M2 stuff for the day. Matsushita showed off its reincarnated M2 console and a playable game at the Digitalmedia World Expo in Japan. Despite the fact that Matsushita scrapped plans for a M2 videogame console, and the hardware is no longer cutting edge, the system was on display at the recent Digitalmedia World Expo in Japan. A demo of a Karaoke title called Digital Dance Mix Namie Amuro was displayed alongside a side-scrolling shooter. The controllers resemble the three pronged design of the Nintendo 64 and raise questions of the true purpose for the machine. After Matsushita supposedly gave up its console dreams, the M2 was going to be a set-top box, but with its game console-like showing in Japan, the company may have other plans. Battle Tryst! 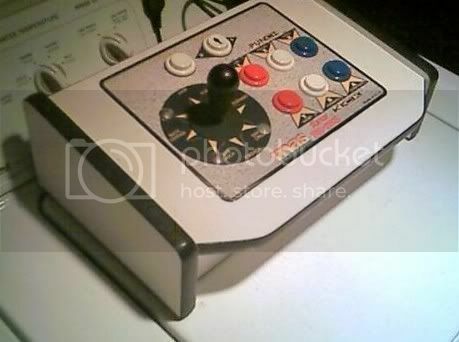 was released on M2 hardware - it looks a bit like an uprated Toshinden anyone know more? I have Battle Tryst, but I have not gotten around to purchasing a supergun to play it. Here are some pics. You can see the two PowerPC IC's, and the Battle Tryst disk when the drive is opened. I'd love to hear some first hand experiences from anyone who has ever played any of these games. 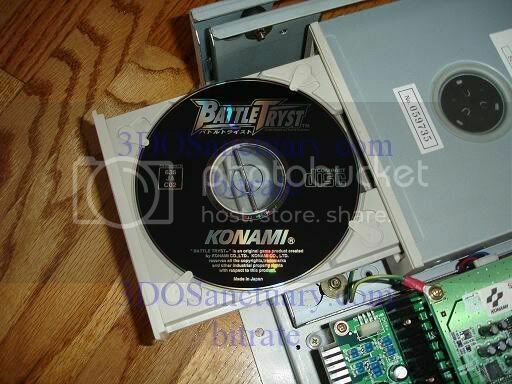 bitrate wrote: I have Battle Tryst, but I have not gotten around to purchasing a supergun to play it. Personally, I would go with the SUPER NOVA instead. The SuperGun was nice in it's day, but the Nova is much smoother. Some quick screens from the Dolphin promo. Oh, why not just post them. Trev wrote: Any additional info? I've read about the dance game demo before, but I've never heard of PonPon. What is Pon Pon? Heh, think a cross between the game MEMORY and WHACK-A-MOLE. There were a few Japanese sites that sold the M2 & PonPon as a package deal. Though you'll have to just search for PONPON LAND (ぽんぽんらんど or ぽんぽんランド in Japanese) and hope for some good luck. Hey, you might even ask PONPON LAND. I take it since you found the PON PON Sheets then you also have these, but I'll post them anyhow. A series of games for testing the elderly. Includes, memory, hand eye co-ordination, reaction time, judgement and more. Im gonna put my website back online, if I have enough content. The chip express chip was called Bridgit - it's main purpose was to allow the Mac host to be a bus master (via DMA) on the 602 bus. The chip with the fan is the main M2 ASIC. I _think_ the chip with the 3DO logo is the Opera cel engine - the Bulldog team (later "Cagent") had originally hoped to emulate the 1st gen 3DO inside M2, but for business reasons that idea was discarded. The unpopulated headers were logic analyzer headers with pinouts made match a HP (1xxxxx series?) logic analyzer pods. They connected to the 602 bus. Brief excerpt from an IGN interview form October 1996, shortly after Interplay had moved development of Clayfighter form M2 to N64. N64.com: What kind of difficulties or benefits are you encountering as you develop for N64? Like for instance, did Nintendo just sell you a workstation and say good luck? Or did the company provide you with a large development library from which to work? Jeremy: One of the great things about N64 is the lack of bull&$#! you have to cut through to do what you want with the machine. The N64 manual is literally one small binder. This is as opposed to about seven binders 3 inches thick for M2, with a huge library of stuff that you had to use. N64 gives you the specs on accessing the hardware. And from there, it's your boat. I think, off-hand, you have like two files to include. That's it. Yawn. The less-is-better approach works here. Our programmers love it, I love it. It's great. In addition, we have support at Nintendo that we can contact for any little problems. The hardest part was getting a functional SGI. Was N64 really that much easier to develp for? Maybe it was a case of teams not coming to grips w/so much power so early on? Was N64 really that much easier to develp for? Yes, it was. The problem with the 3DO and the M2 was that the developers never got to see the hardware docs, 3DO kept them secret. So they had to use all the slow and buggy functions that the OS provided, instead of programming for the hardware directly. Trev wrote: Was N64 really that much easier to develp for? I've been reading through the 3DO SDK, and this is addressed at one point. Basically, what it comes down to, is that you can't write directly to the hardware because there are so many different hardware variations and configurations. There were lots of plans for more configurations with different amounts of RAM, VRAM, etc. Writing to an OS instead of hardware has a lot of advantages as a programmer -- like extensive memory and thread management. It's quite nice for someone that doesn't have much experience developing for a game console, making it easy to jump right in and get working software up and running. On the other hand, I would imagine that the Clayfighter developers, having had more experience writing to platforms like the SNES and Genesis, would be much more used to writing to the hardware directly, making it difficult to transition to something like the 3DO or M2. the first ones are new added. I've made some screenshots of my M2 Development & Emulation Card "working". This is the Desktop of my M2 Apple PowerPC. This is a converted graphic into 3DO Cel format. I generated Symbol 10 pt as a M2 font. More inside of my profile. Someone scanned some of the later Next Generation magazine M2 articles (which makes me wish I could read the rest that were not scanned) a few years ago. I managed to bring up the index of them on web archive and I've re-uploaded those articles. It's the 4th video down "Shooter Room". Obviously this was also prerendered CG, not something M2 could've done. I saw it in motion on television in 1995. As I recall it was incredibly smooth, 60fps, totally anti-aliased. The lighting was awesome. textures amazing. wicked cool. It looked better than anything that Dreamcast or PS2 ever did years later, and at least on par with the most impressive stuff ever seen on Xbox or Gamecube (maybe more so). The truth is, even SGI's most powerful hardware of the time, Onyx RealityEngine2, costing $100,000 ~ $200,000 or upto several million dollars in multi-rack configurations, was NOT capable of doing any of these pre-rendered CG "M2 PR" demos, in realtime. They were done, pre-rendered on lower-end SGI workstations. I seriously doubt even SGI's then-next-generation InfiniteReality graphics subsystem released in 1996 with about ten times the performance of RealityEngine2 (IR could do 10 million+ polys/sec with all features) could pull that stuff off in realtime, either. Not until we get to SGI's more modern hardware of the last 5 years or so, like UltimateVision released in 2003 which uses 4 to 16 (or more) ATI R3x0 GPUs (each equivalent of a Radeon 9700/9800) in parallel, could those CGI demos be done in realtime at 60fps. We could now (since 2005/2006) have that stuff and beyond it done realtime, in-game on Xbox 360, PS3, PC, no problem but it took a decade (1995 to 2005/2006) to get there. If 3DO & Panasonic released a new system every 3 years or so, as they were planning (3DO: 1993, M2: 1996/1997 MX 1999 ?) we would probably be playing on M5 now. 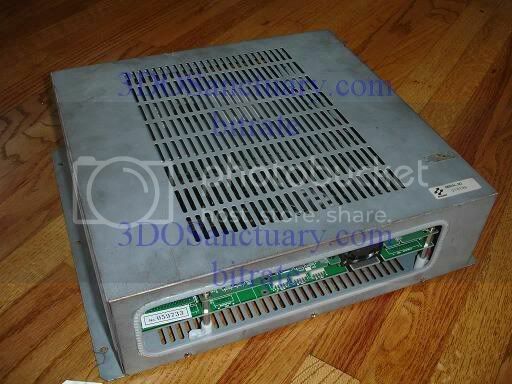 3DO Systems/CagEnt was a few years ahead of the PC 3D industry (Rendition, 3DFX, PowerVR, 3DLabs, Nvidia, ATI, etc) and also ahead of Sony and Nintendo with SGI. If that trend had continued, their current console could've been better that other current-systems. Or not, since Nvidia & ATI got much, much MUCH better with the influx of engineers from SGI/ArtX, Evans & Sutherland, Lockheed Martin/Real3D, 3DLabs etc, and Sony switched from in-house graphics to Nvidia. Last edited by parallaxscroll on Tue Aug 12, 2008 6:56 am, edited 3 times in total.